How did Sad Girls come about? I’ve written many stories set in and around Whittier, California where I grew up from 1984 to 1995 (I was born in nearby Montebello, with grandparents and various other family in both Pico Rivera and Whittier; I was an army brat so Whittier was always home but I didn’t always live there until we moved back to the states in 1984). Early on I’d write stories about what I knew: My Whittier, Mexican-American, and Okie upbringing of middle and lower-middle-class kids making their way through first and second-generation attempts at college. But when I’d send pieces out in the ‘90s and even in the 2000’s, I’d often hear back from editors that my stories, while good, didn’t seem believable. What Los Angeles County was I writing about? There were no gangsters. There weren’t very many homeboys. There were however, Mexican-American kids who couldn’t speak Spanish very well and loved the Smiths, Andy Warhol, and getting lost in books. I briefly freelanced for a magazine whose target audience was exactly ‘my people’ and advertisers told the managing editor that our demographic didn’t exist. It’s a weird thing to know that people don’t think you exist. So that’s when I decided that I would create characters like those I knew growing up in high school and college in Whittier. I would create the people who others insisted didn’t exist. The other, Los Angeles, if you will. What’s your favorite story in the book? Which one was the hardest to write? Some of the stories are based on conversations I’ve overheard bits and pieces of, or forgotten lore in Uptown Whittier where I worked through college. What’s always difficult is when you base something on truth. One of the hardest stories people have trouble believing is “Gordita’s Ride,” which ironically is the one story where all the bus conversations are things I actually overheard when I used to take the bus to work at The Los Angeles Times from Whittier to downtown Los Angeles. People would announce the craziest things on the bus. So all that dialogue is verbatim but since it’s so horrendous people think I made all the dialogue up. But the love stories that are totally fictional and not based really on anything? Those are the ones people think must have really happened. It’s funny to me. I think my two favorites are “Come and Play” –probably because it’s the first story I wrote for the collection, and “Queen Anne’s Lace,” which is one of the final ones I wrote for it. I’m kind of chicken about getting big complicated painful tattoos so it’s good for me to write about them instead. What do you hope readers take away from the book? I hope I provided a window into another world. And that world of course is gone. The Whittier of my youth has long since gone away. They rebuilt after the earthquakes. We have more chain stores here now. Uptown is a destination and you can’t find parking up there. In my day it was just a forgotten section of town that only odd kids and skaters found appealing. Now it’s hip. That will always be weird to me. And it’s sad to me too because it’s lost some of its uniqueness. It is almost any Los Angeles suburb now and it used to be distinctive—founded by Quakers with old Craftsman houses and lots of bookstores. Now there’s only one bookstore. What’s your current favorite book? All-time favorite? The last book I read that I adored was Lidia Yuknavitch’s Chronology of Water. I’m working on a memoir myself and Lidia’s book has to be THE memoir of the last 25 years. 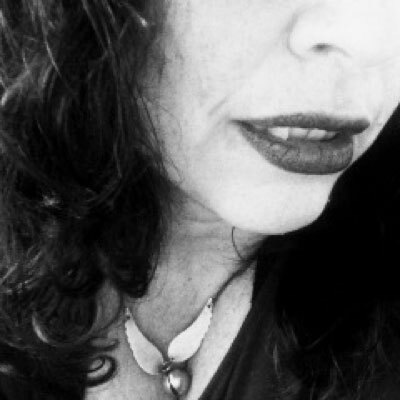 She’s raw and I love it when writers experiment with style, punctuation, and language, creating odd uses of phrases and words forcing me to think about words in a new way. That gets me. I have a long list of favorites but it always starts out with 100 Years of Solitude by Gabriel Garcia Marquez. I love Flannery O’ Connor’s The Violent Bare It Away. Nathaniel West’s Day of the Locust is my favorite Los Angeles book. Zora Neale Hurston’s Their Eyes Were Watching God. Jeanette Winterson’s The Passion. Crime & Punishment. The Sound & The Fury. I’m pretty old school. You write a comic zine with your daughter -you must be a cool mom. How do you balance writing and parenting and all the other fun sounding things you do? I don’t know if my kids think I’m a cool mom, but perhaps they will someday. My son (age 12) wants to be a filmmaker and is an artist and the two of us bond over movies and art and the bond is pretty strong (my son and I love Lawrence of Arabia, Doctor Who, British bands and martial arts movies, which bores my husband and daughter). Both my kids have been creative since they were small and they have always taken lessons in various arts. As for the comic zine: Paloma was growing keenly aware of sexism in politics, sports, etc. (she’s a big reader) and she felt a little left out of our projects. She loves American Girl dolls because she can get dolls that are brown and look like her—with glasses! She loves comics and we were talking about having a superhero that looked like a Mexican-American girl. Paloma came up with a girl with sensible combat boots, a cape, who could run fast, and she purposefully gave her comfortable clothes to wear too. I loved it! The illustrations have always been entirely Paloma’s idea. I will write something—sometimes child appropriate and sometimes not (and then I don’t let her read that panel) and I tell her what I’m thinking might go there and then she comes up with something. It’s great because it’s an uneasy read to have adult content with kids’ drawings and it forces the reader and viewer to look at things differently. We sell “The Adventures of SadGirl the Superhero” on Etsy through our site Sierramaid. I think it works that my children have always seen my husband and I immersed in projects. They’ve grown up thinking that that’s what people do: creative projects. So our family kind of runs on the idea that we all need time, space, and to respect each others’ projects. Most of our friends are artists, musicians, writers, and scientists, and most of them didn’t have children. My kids actually are growing up thinking it’s a normal everyday thing to create and invent and I love that. 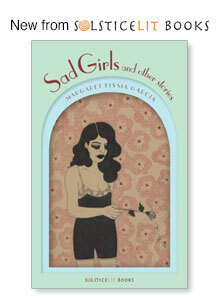 Read SAD GIRLS AND OTHER STORIES, available for download on our website or on Amazon! Thanks Mardith! Glad you enjoyed it- I thought Margaret’s responses were fabulous! Sounds like a great book of stories. I’ve put it on my list. I love the idea of having your child illustrate your writing and the difference in perspective it has to create. Also that your demographic doesn’t exist!!!??? Thanks, Amy, for introducing me to an author I didn’t know about.